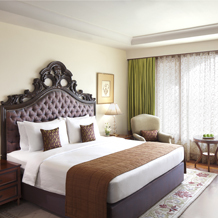 The Taj Club Rooms welcome guests with a stately simplicity. A parquet floor foyer with mirrors leads the way to a large king bed dressed with plush bolsters, pillows and linens. The surrounding cabinetry is done in chic, dark woods, which conceal spacious closets and modern electronics. The four-fixture bathroom is a gleaming haven of marble, glass and stylish European hardware. The shower cubicle and tub are separate. Taj Club rooms have all the amenities of the Deluxe Rooms with the additional hospitality of private check-in, and the use of the Taj Club Lounge with complimentary Continental breakfast, tea service and cocktail hour. provided with a complimentary bottle of wine, chocolates, fresh flowers, a fruit basket and a choice of newspapers and magazines. Complimentary transfer from the airport to the hotel. Daily continental breakfast at the Taj Club Lounge. Service of hot & soft beverages throughout the day, at the Taj Club Lounge. Two pieces of garments for ironing per stay. Daily 30-minute complimentary Internet Access at the Taj Club Lounge or the Business Centre. Daily evening cocktails at the Taj Club Lounge featuring a selection of carefully crafted petit fours and hors d'oerves. LIVE a king style life in one of these rooms.